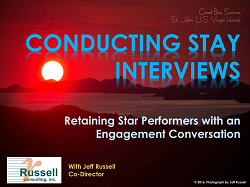 Leading in Permanent Whitewater (ASTD) – Russell Consulting, Inc. Leading in an Age of Permanent Whitewater - This time of great uncertainty calls for a new definition of leadership that provides a new kind of guidance to those looking for direction. Jeff presented Russell Consulting, Inc.’s innovative approach to leadership in a time of uncertainty at the ASTD of South Central Wisconsin’s Learning Summit. 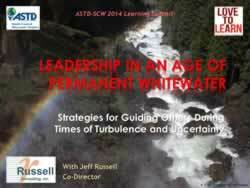 Click on the graphic above or here (Leadership in an Age of Permanent Whitewater) for a PDF version of the PowerPoint slides. Contact RCI for more information on our leadership workshops.